A new type of imaging technology uses the mid-infrared part of the spectrum and "thermal lensing" to visualize living cells and organisms, an innovation that could bring insights into drug delivery and cancer treatment. "It's very important to be able to study and understand the chemistry of living systems for research into drug delivery and disease processes," said Ji-Xin Cheng, a professor in Purdue University's Weldon School of Biomedical Engineering and Department of Chemistry. Infrared spectroscopic imaging has been limited to studies of dried tissue samples because water molecules absorb and interfere with the infrared signal. At the same time, the technology has not been capable of high-resolution imaging or visualizing layered sections, which is needed for detailed studies of three-dimensional samples such as a biological cell. The mid-infrared photothermal (MIP) approach, a culmination of two years of research, overcomes these limitations, Cheng said. Researchers have used the system to visualize lipid droplets - a key biomarker for disease - and drugs inside living cells in laboratory cultures and also in a roundworm called C. elegans. The system provides "label-free" imaging, meaning no fluorescent dyes are needed. "This is important for understanding the drug-delivery pathways, the drug-action mechanism for treating cancer and other diseases," Cheng said. "Drugs are small molecules and not fluorescent, so this method provides a way to identify and locate the drug molecule in cells and tissues." Findings are detailed in a paper appearing Wednesday (Sept. 28) in the journal Science Advances. The paper's lead author is Purdue postdoctoral research associate Delong Zhang. The technology makes it possible to study the dynamic chemistry inside cells and tissues. "The reported MIP imaging technology promises broad applications from monitoring metabolic activities to high-resolution mapping of drug molecules in living systems, which are beyond the reach of current infrared microscopy," Cheng said. MIP works by shining a mid-infrared laser on tissue, generating heat and producing a "thermal lensing effect." "It's similar to the mirage effect that you see on a hot summer day over a road surface," Zhang said. Because infrared wavelengths are large, they cannot resolve the fine chemical details of the contents of live cells and organisms. 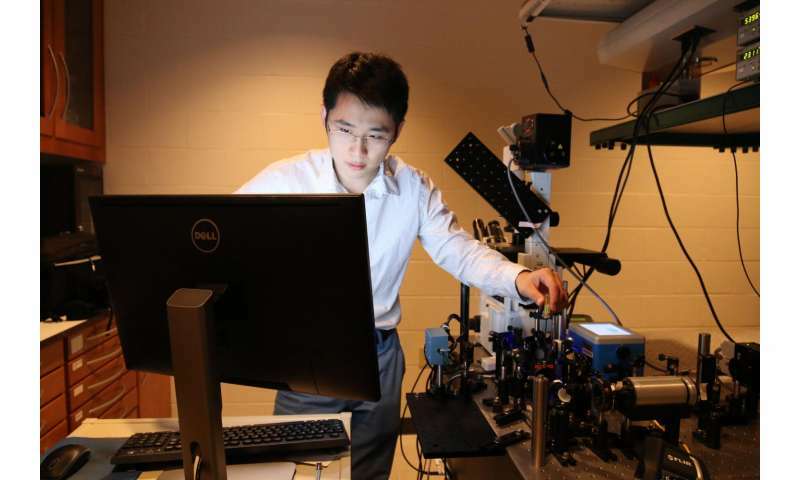 "So we use a second laser at a much shorter wavelength, which gives us sub-micron spatial resolution, 10 times better than traditional infrared microscopy, and this resolution is essential to see the intracellular structure," Cheng said. "You also produce a photothermal spectrum, and that provides the molecular information." The system can determine the chemical composition in "micro-molar" concentrations, which allows mapping of drug molecules and monitoring metabolic activity inside of cells. The paper was authored by Delong; doctoral student Chen Li; postdoctoral research associate Chi Zhang; research professor Mikhail N. Slipchenko; Gregory Eakins, an instrumentation specialist at the Jonathan Amy Facility for Chemical Instrumentation; and Cheng. Making the high-resolution imaging possible is a new "resonant amplifier" that picks up the photothermal signal and was designed by Eakins. The researchers have filed an application for a provisional patent through the Office of Technology Commercialization in the Purdue Research Foundation. Future research will include work to improve the speed of the technology. "Now it takes 8 seconds per image, which is too slow because cells and molecules are in constant motion," Cheng said.